Much media coverage was given to the signing on May 28 in Trinidad of a Trade and Investment Framework Agreement (TIFA) by US Vice President, Joseph Biden, and current Chairman of the 15-nation Caribbean Community, Haiti’s President Michel Martelly. The United States-CARICOM Council on Trade and Investment which oversees the TIFA, is supposed to meet before year-end. CARICOM countries should be pressing for that meeting, but they should also have in place concrete and realistic proposals for enhancing aid for trade, and US investment in critically-needed infrastructural projects as well as health and education schemes. There should also be serious proposals to curb US finger-pointing at the Caribbean financial services sector as well as US extra-territoriality schemes such as the Foreign Accounts Tax Compliance Act (FATCA). These latter matters should be replaced by mutually-beneficial arrangements that are co-operative. 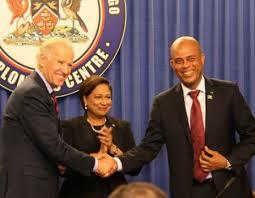 According to the Prime Minister of Trinidad and Tobago, Kamla Persad-Bissessar, who hosted the US-CARICOM meeting on May 28, the talks with Biden were sometimes ‘brutal’. Fortunately, they could be. It is doubtful that there will be any such ‘brutal’ talks with the Caribbean’s next visitor – President Xi of China.